The monument was unveiled by fighters of Donbass, Sich and Karpatska Sich volunteer battalions. 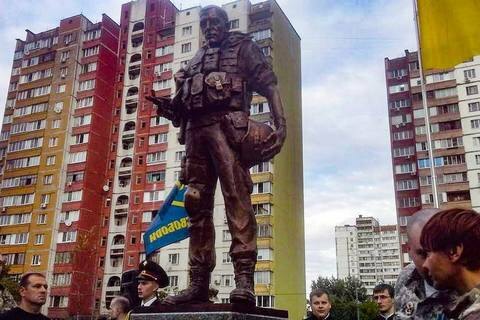 A monument to volunteer combatants was opened on Sunday, 10 July, in Kyiv district of Troyeshchyna. The 2.05 m bronze monument was installed at 2-2-A V. Mayakovskiy St. an LB.ua correspondent reported. The ceremony was attended by deputies of the city council and the Verkhovna Rada, who initiated who have organized the creation and installation of the monument, city mayor Vitaliy Klitschko, ATO fighters and local residents. After the unveiling ceremony, there was a concert by rock groups Haydamaky and Tin Sontsya. Before the city council gave green light to the monument, the project passed a public discussion and won the support from the residents of the district. No funds from the city budget were used for the creation of the sculpture.